Granny's FD/V8 Base Subframe- Designed with value in mind, this version of our subframe features fabricated lower control arm pivot areas constructed from 12ga. 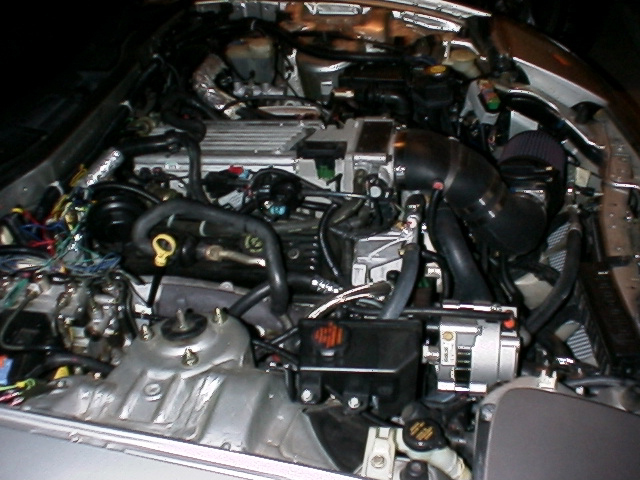 steel (same as stock FD), while the remainder of the main structure is made from 14ga. sheet. Finished weight is slightly more than the stock RX-7 unit. Our subframes retain ALL the stock lower control arm mounting locations to retain the FD's original race car inspired suspension geometry. The econo subframe is jig welded, and has all the eccentric stops required for frontend alignment using stock hardware. A satin black paint finish helps keep cost to a minimum. 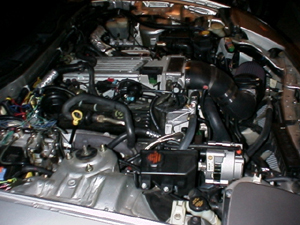 Available in optional versions for "old-school" SBC, LT-1, and LS1. 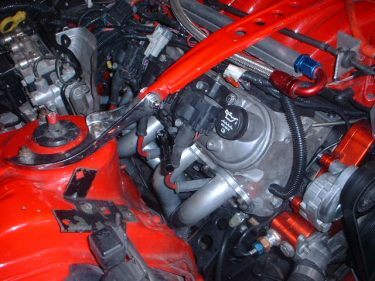 A change in steering rack location can be specified (no extra charge), making it possible to fit an LS1 under the stock RX-7 hood (competition/track use only). Also available in a "blank version" w/o engine mounts for those that want to install an engine other than those listed above. 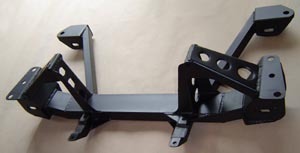 NOTE- Our subframes feature custom fabricated lower control arm mounting points. 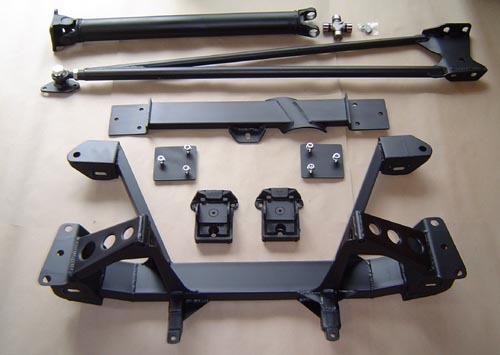 You do not need to send your old subframe to us, as we do not need to salvage any parts from it. You save on shipping, and you can still sell your old subframe to someone else to save even more money. The price for the SB Chevy V-8 Base subframe alone is $1035. The price for the SB Chevy V-8 Base subframe "blank version" is $865. FD/V8 Base Transmission Crossmember- Added to support the rear of the V-8 transmission when the rotary engine's "Power Plant Frame" is removed. The original FD design featured aluminum crossmember/struts that spanned across the bottom of the transmission/driveline tunnel. These struts helped box the bottom of the tunnel to add strength to the floor pan, but relying their thin sheet spot welded chassis attachment points to mount a V-8 transmission is a bad idea. They were never designed to carry the weight of a V-8 transmission, and adding stresses from the front of the V-8 torque arm would guarantee their failure. Our transmission crossmember is designed to spread these loads out thru 6 stronger points in the FD's floor pan, distributing the added stresses thru a much larger/stronger area out by the FD's subframe connectors. The attachment points at the ends of the crossmember bolt to 3"x6" back-up plates that are installed from the top side of the floor pan, sandwiching the RX-7 floor pan between. This design eliminates depending on the the spot welded connection of the RX-7's stock tie-strut mounting pads as a crossmember mounting point, which would result in the likely fatique cracking of your floor pan at the spot welds. Our crossmember is fabricated from rectangular tubing, and features a recessed area on the passenger side for large diameter exhaust pipe routing above the crossmember for maximum ground clearance. It features the same satin black paint finish as our econo subframe to keep costs down. These crossmembers have evolved over time, and now come standard with dual exhaust cutouts and additional cutout re-inforcement plates, no extra charge. The price for the FD/V8 Base crossmember alone is $285. FD/V8 Base Torque Arm / Anchor Bracket Assembly- This heavy duty "torque arm like" assembly (actually a front diff mount arm) was designed to handle in excess of 5000 ft/lbs of torque. The tubular construction features a direct threaded 1-1/4" diameter .095 wall DOM lower tube to withstand the tremendous compression loads seen during acceleration. The upper tube is a 1" diameter .095 wall steel tube that is slotted and welded to the anchor plate in the rear, increasing weld area, and insuring that tube welds are not placed in direct tension under acceleration. Our long "torque arm like" design for the front diff mount reduces the surprisingly high differential "reaction force" to an amount that easily handled by the RX-7's stock chassis, as this load is further spread by our transmission crossmember's additional attachment points and fed into the chassis near the stock RX-7's chassis stiffening "subframe connectors". The rear bracket is designed for substantial abuse as well. 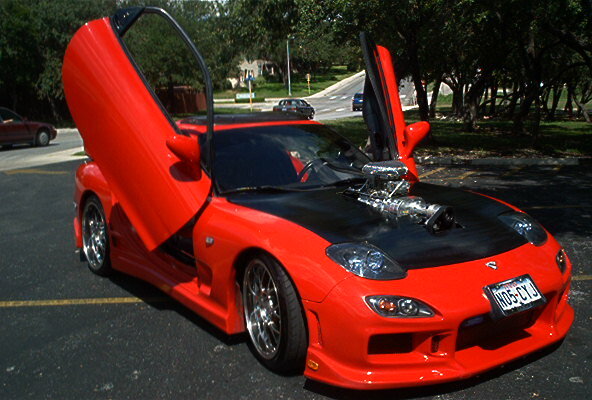 All differential attachment parts are formed from .250" thick steel plate, using ALL 5 PPF mounting points on the RX-7 differential for maximum strength. The bracket/torque arm design places ALL the welds in shear along the weld axis for the ultimate in load bearing capability. Torque Arm tubes are placed in-line with the differential mounting points, eliminating the bending or tearing stresses at the welds that are found in other designs. A generous radius between the torque arm mounting eyes helps distribute forces over the widest possible area. It features the same satin black paint finish as our econo subframe to keep costs down. Custom lengths are available. The price for the FD/V-8 Heavy Duty Torque Arm Assembly including the front anchor bracket is $365. FD/V8 Base Steel Driveshaft- While aluminum driveshafts are generally perceived as being lighter and having less rotational inertia, in practice there is actually little difference for the RX-7 except for the cost. The aluminum shaft is made from larger diameter/thicker walled tubing, negating most performance advantages from using the lighter/more expensive material. We prefer the smaller diameter steel driveshaft as it leaves more room for larger diameter exhaust pipe routing. Our driveshaft features much larger replacable front and rear u-joints, and bolt directly to the FD's stock rear pinion flange. A slip yoke is available for an additional $70, allowing you to use an existing slip yoke from your donar car if possible to save even more money. The price for the FD/V-8 Base driveshaft alone is $335. ...FD/V8 Base Driveshaft (includes u-joints and HD rear flange)............................$1965. + shipping. 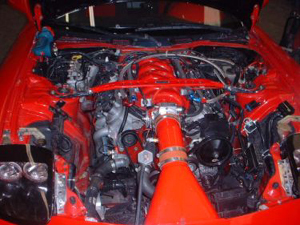 ....To add LS1 adapter plates and rubber mounts, ...............................................................add $115. ....To add a driveshaft slip yoke..........................................................................................add $80. As these parts are made to order, please allow at least 2 weeks for delivery.